1 OWNER WITH CLEAN CARFAX. 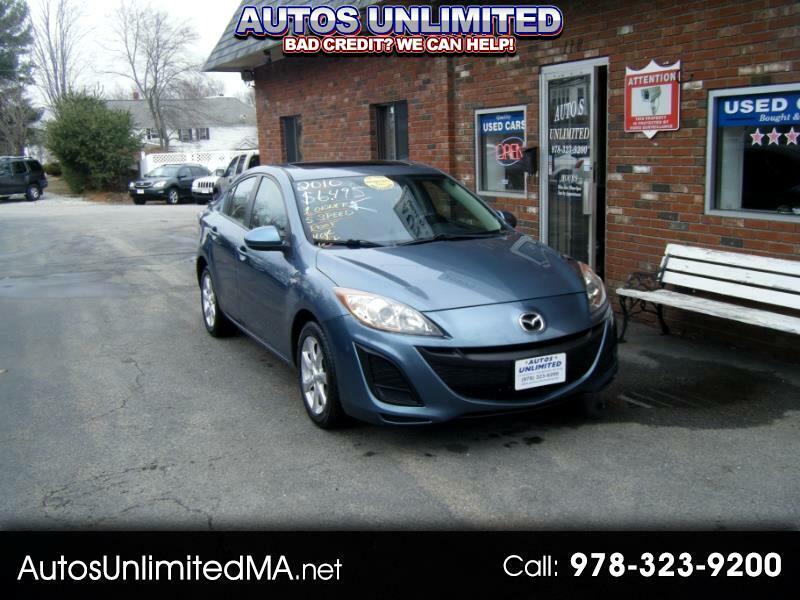 2010 MAZDA 3 TOURING. GAS SAVING 2.0L 4 CYLINDER, 5 SPEED MANUAL TRANSMISSION. POWER WINDOWS, LOCKS AND MIRRORS, SUN ROOF, REMOTE START, ALARM/KEYLESS ENTRY, COLD AC, BOSE 6 DISC SOUND SYSTEM WITH AUX AND MP3, NEW REAR TIRES, FRONTS ARE 80%, ALLOY WHEELS AND MORE. RUNS AND DRIVES EXCELLENT. 90 DAY/3000 MILE WARRANTY INCLUDED. ALL FOR $6495. EASY FINANCING AVAILABLE $0 DOWN AND $33 PER WEEK. FOR MORE PICTURES, INFO AND TO GET APPROVED TODAY PLEASE VISIT AUTOSUNLIMITEDMA.NET OR CALL AUTOS UNLIMITED 978-323-9200. IF YOU PREFER TEXTING PLEASE TEXT 978-726-4107 AT ANY TIME. THANK YOU. You promise to pay us the principal amount of $6,495.00, plus a time price differential accruing on the unpaid balance at the rate of 9.90 % per year from today's date until maturity. The time price differential accrues on a 365 day basis. After maturity, or after you default and we demand payment, we will earn finance charges on the unpaid balance at 9.90 % per year. You agree to pay this Contract according to the payment schedule and late charge provisions shown in the TRUTH IN LENDING DISCLOSURES. You also agree to pay any additional amounts according to the terms and conditions of this Contract.